There was once a mermaid named Verdi, who longed to fly. When waves roiled and bubbled on the surface and the depths turned murky and opaque she longed for sun. On clear days the limpid emerald and turquoise seas drove her mad with their banality. She longed to swoop through a gamut of blues whose cerulean hues held no hint of green. Whenever she could, she rose to the surface and sent her woes spiraling heavenward in a high-pitched aria of sadness and despair. Sometimes, when huge weather systems marched across the endless expanse of ocean, strong winds preceded them, heralding change with a phalanx of whirlwinds each bearing an armful of spoils torn from fertile lands beyond the horizon. Occasionally, their booty came as petals stripped from the flower pots and gardens of fisher women. Verdi gathered them carefully, transfixed by the faint hint of fragrance still clinging to each scrap of shimmering color. In the short time before they turned to slime, she laid the petals out on the back of a large sea turtle, summoned from the depths to act as her table. Arranging and rearranging them, Verdi tried her best to imagine their original configuration. But, she never could and then the sad, heart-breaking song would rise from the sea again, distressing every living thing above and below the surface. One day an owl happened to be passing while Verdi was mixing and matching the flower petals. As he slowed his flight to see what she was up to, the tip of his wing crossed her peripheral vision. Without knowing what he was, before her head had swung around to follow his flight, she ensnared him in a web of golden trills. The beautiful notes, tough as spider silk bound his wings together and he tumbled out of the air. SPLAT! Down, down down he fell, onto the turtle’s back. The owl shook himself and stood up. His huge yellow eyes raked the mermaid’s sullen face and weedy locks. ‘You haven’t any wings,” observed the owl craftily. Her wings stuck out on either side of her body, just below her arms. She gave them a lazy flap and felt the air beneath her catch and take hold lifting and carrying as if she were a piece of thistledown. The view was all she hoped it would be. There on the very tip of the horizon she caught the glint of a palm leave rustling in the breeze. The owl flew alongside her. Normally he wouldn’t bother with a wisher, except for the actual granting, but something about Verdi made him curious to see what would happen next. Land was all she had hoped for – the sights, the sounds, the smells and textures. How different everything looked when it was dry! Not quite as rich and shiny as when wet, but the variety more than made up for it. She flew and flew, soaring, diving, gliding and indulging in acrobatics until suddenly, far from the sea, hunger pangs sent tremors through her new wings and she realized how tired she was. “How do I land?” she demanded. “Is it your wish to land?” asked the owl casually? “On my feet,” smirked the owl. The mermaid flapped her tail. They were flying over a thick patch of forest. Her stomach rumbled, interrupting the string of increasingly panic-stricken thoughts. “I wish I had…” She clamped her teeth down hard on the tip of her little green tongue and winced. Your wish is my command,” he murmured sweetly. “Take me home,” she ordered wearily. In the blink of an eye, she was floating, once again, beside the patient sea turtle. 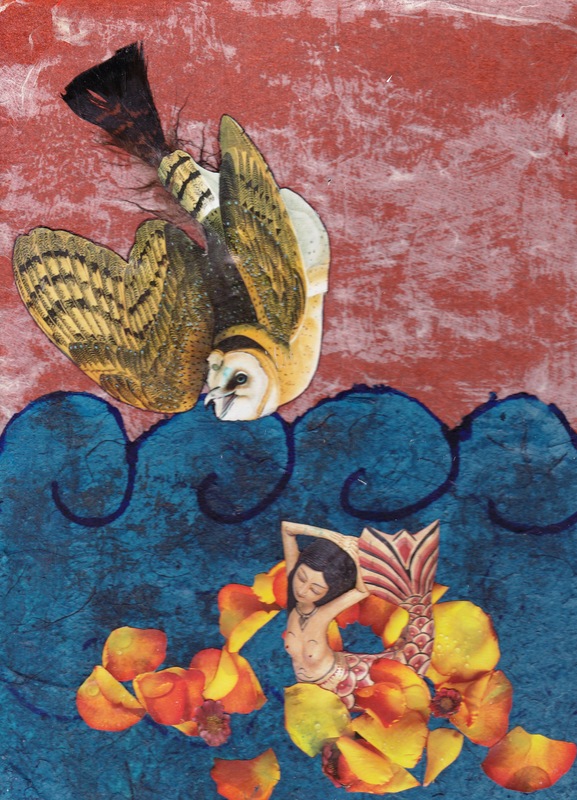 The owl had disappeared, but the wings still hung by her sides so water-logged she was never again able to launch up into the sky, no matter how she practiced. Nevertheless, Verdi loved her wings; liked the distinction they bestowed. To her delight she discovered they worked well underwater, propelling her forward more swiftly than she’d ever swum. She soon became a hunter and explorer of renown, traveling all the seven seas and finding wonders in their depths to equal anything on land. Occasionally, she thought of the owl and sent a song winging his way. But nothing ever came of it because, from that day forth, he steered clear of ladies with tails.